Application deadline for the Special Summer Immersive Data Science Bootcamp is May 10. Apply now! Deposit for 12-week immersive data science bootcamp. 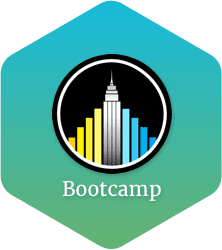 In this program students will learn beginner and intermediate levels of Data Science with R, Python, Spark and Hadoop as well as widely used industry tools such as Selenium, Caret, Tensorflow, MongoDB, AWS, and more. A deposit of $5,000 is required within 7 days of acceptance to secure your spot. After making your deposit, the remaining tuition is due on the first day of the Bootcamp. NYC Data Science Academy teaches data science, trains companies and their employees to better profit from data, excels at big data project consulting, and connects trained Data Scientists to our industry. NYC Data Science Academy is licensed by New York State Education Department. Get detailed curriculum information about our amazing bootcamp! Sign up completed. Thank you! Be the first to get notified on new courses and special events!